For Eila Walker, history has become its own demon. After months of trying to keep ahead of those who are hunting her, Eila is more than ready to end her days of running. But her ancestor, Elizabeth, has left a twisted legacy in her wake that shadows Eila still, nearly 170 years later. When her grandfather reveals that he has kept a priceless piece of the past hidden in his vault on the island of Polaris, Eila and her friends are hopeful they may finally find the answers they so desperately need. First, let me start out by saying that True North is officially the first new book (besides a school required one that I am not counting) that I have read in 2016! I know it's shocking that I haven't read any new books in over a month, but that's what happens when you are a high school student with truck loads of work every day and very bad at time management. However though, I am happy to say that I couldn't have been more happier than to start 2016 with True North! Just when I think that this series can't possibly get even better than it already is, I am given another book that totally blows that thought out of the water! Let me warn you that unlike the first two books in this series, this one will definitely put you through the wringer and leave you an emotional sobbing, smiling, and laughing mess. It seems that with every book, the secrets, twists, and new surprises get even bigger than before. Everything is much more intense and trust me when I say that you will not be able to put this book down for even a second! As usual, I don't have enough words to describe how much I have come to love these characters! I am not going to repeat myself and tell you all how much I love Eila, Rafe, Kian, Ana, and MJ. I already did that twice in my reviews for Undertow & Stormfront. However, what I will tell you is that my heart broke for Eila in this book. And also, if you didn't already love these characters before (are you nuts? ), you can expect that after reading this book, you will become their #1 fan! The ones that I will be talking about though, are the semi-new characters that we got to know better. Let me start out with Christian & Rillan. In the last two books, I had my doubts about them. I didn't think they were necessarily bad, but it was still hard for me to completely trust them. But after getting to know them more in detail in this book, all I can say is that my heart breaks for these two characters. They have been through so much and yet managed to survive. And they are doing all they can to help Eila, no matter what the cost. They have definitely grown on me and I have really become fond of these two! Also, I'd really like to just reach into the book and give Rillan a nice big hug because he really deserves it. Another character, one that totally took me by surprise, was Nicki Shea. I was prepared to to hate her. However, what I wasn't prepared for was to start feeling sympathetic towards her, and actually starting to like her. I know. Shocking right? But what happened was that from the minute she came into the picture, I found it hard to actually hate her. Even though she acts super mean, it was easy to see that it wasn't the real her. And after everything she has done in this book, I can for sure say that Nicki is now one of my favorite characters and for me, she is officially a part of Eila's crew! As for the writing itself, storyline, plot, and pacing, they were nothing but perfect! Surprisingly, despite being over 400 pages, True North was a fast read for me, but I guess that's what happens when you get a book as good as this one! The only bad thing about this book is that because it was so good, waiting until NEXT YEAR for the next book is going to be nothing but pure torture! I guess the only good thing though was that Ms. Conway took mercy on us and did not end this book on a terrible cliffhanger. 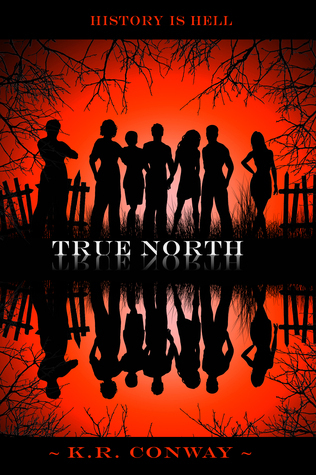 Overall True North was beyond awesome and you definitely need to run and grab this book from the store as fast as possibly possible!